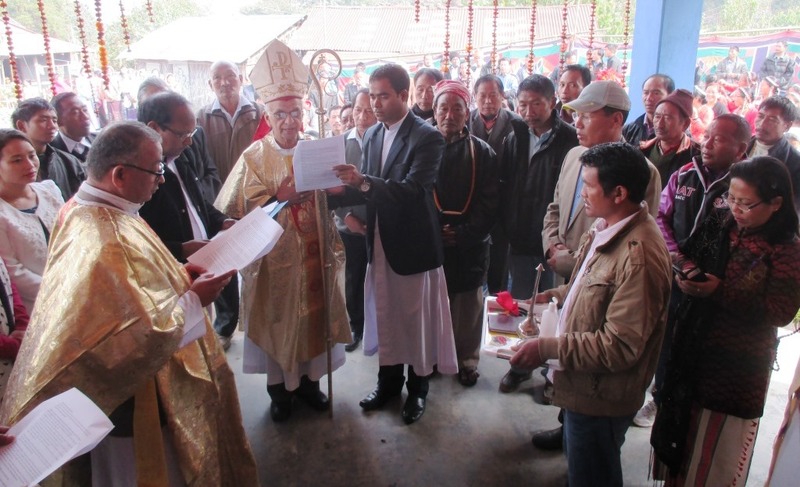 The new Catholic community at Thinsa village of Khonsa Parish were beaming with joy on 12 December 2015 as they had in their midst Archbishop Emeritus Thomas Menamparampil SDB, to bless their new Church in the village. The people of Thinsa, a traditional Nocte Tribal Community, are simple and hardworking and they wanted to have a proper Church building of their own as they were having Mass and other prayer services in the Thinsa Youth club house for the last two years. Since they did not have a Church they they had a great desire to have a place of worship. Bishop George together with kind friends made this wish of the people in Thinsa a reality on 12 December 2015. The Church, named after St. Judem was inaugurated by the chief of Thinsa village and the key of the Church was presented to the Catechist. Fr. PT George, speaking at the blessing thanked Mr. Tengu Lamati and all other kind friends who helped in making this Church a reality.